This fun not-hanging-a-man version of hangman is easy to play on your interactive whiteboard! 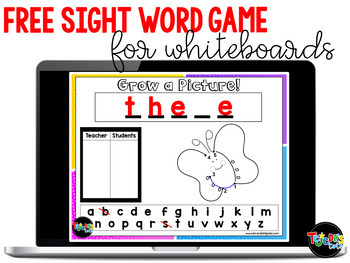 It's perfect for sight word review in 5 minutes. Also perfect for a sub! It’s like hangman, but not. I never really liked the idea of drawing a hanging man, but maybe that’s just me. In this version, kids get to draw a line to build a dot-to-dot picture if they guess a letter incorrectly. It’s a win-win-win (guess a letter correctly / get to draw the picture / incorporates math)! You simply project the game template onto your whiteboard to play. It’s the perfect way to review sight words in an engaging way, and in only 5 minutes (although I think your students will want to play longer)! It's editable, so you can edit the lines for any word. Also included a student version to play during center time.